Being physically active is one key to living a long and fulfilling life. This Physical Activity Pyramid - Exercise Chart Dorm Poster is a cheap college wall poster that will keep you active. Add this colorful and educational college dorm accessory to your college essentials checklists for this semester and be prepared for all college throws at you. 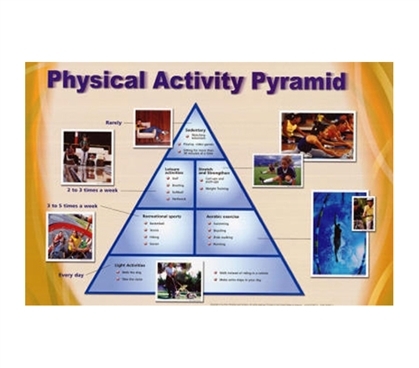 Exercise therapists and sports majors will appreciate this physical activity pyramid dorm poster as a graduation gift. Dorm room essentials, like this unique college room poster in a large 36" Wide x 24" Tall format gives you stylish college dorm door decor without breaking the bank. Get a unique dorm room poster and be set for college.